Coming Events & blasts from the past! Below, in reverse chronological order, find out more about events since 2008 commemorating the sinking of the Republic and the role of wireless in rescues at sea. Calendar for 2018 is in the making...it will be the 109th anniversary of the sinking of the Republic on January 23-24! The first event of the New Year: Gerald Main from BBC Cambridgeshire interviewed me last week. You can listen to the interview here: http://www.bbc.co.uk/programmes/p01n3ch6..
Mr. Main has promised to make a podcast about Jack Binns sometime later this year! Keep you eye on this space or go to the Jack Binns Marconi Operator Facebook page for all news. The Cape Cod National Seashore was host for a series of events celebrating the development of wireless, from the early days of Marconi's efforts at trans-Atlantic communication to the sinking of the Titanic. A feature of the program was a showing of the film about Jack Binns produced by PBS, Rescue at Sea, at the Salt Pond Visitor Center. I was there to provide commentary and to answer questions, and was thrilled to meet so many people with an interest in ham radio and in the Republic. Don Wilding from Wicked Local in Orleans, Cape Cod, interviewed me: see http://orleans.wickedlocal.com/entertainmentlife/20170428/shore-lore-day-for-cqd-binns. 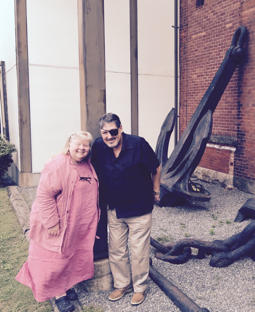 Wonderful day and so grateful to Barbara Dougan of the National Park Service for inviting me. 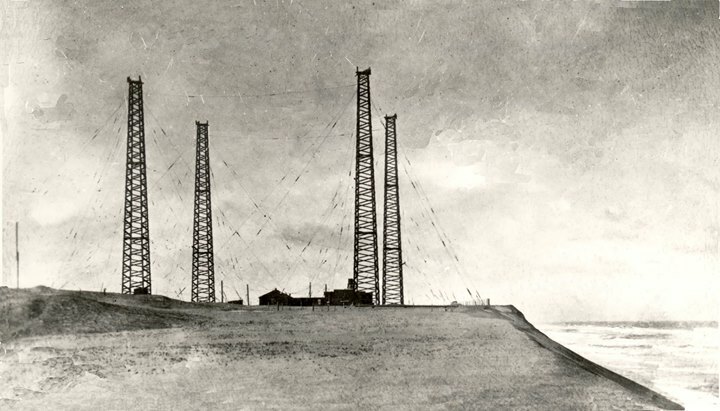 Image: The Marconi Towers on Cape Cod at the beginning of the 20th century, now destroyed by erosion. VOICES FROM THE PAST AT DAYTON HAMVENTION 2016! John Dilks (K2TQN)﻿﻿ gave his multimedia presentation with photos, graphics, and even the VOICES! of wireless pioneers, including Marconi, JACK BINNS, Irving Vermila (Ham #1), Dr. Lee DeForest, Hugo Gernsback, Edwin Armstrong, and so many pioneers with their "firsts!" The 100th anniversary of the sinking of the Titanic! WSKG, our local public radio station, presented a short interview detailing Jack Binns' role in that disaster on April 13th. You can find the link at http://wskg.org/wskg_news/dots-and-dashes-jack-binns-and-titanic﻿. Virginia Lovelace, Jack Binns' granddaughter, and Evera Lovelace, his greatgranddaughter, attended the screening of the PBS American Experience documentary about Jack Binns, "Rescue at Sea," at the Cape Cod National Seashore on April 19th at 3pm, Salt Pond Visitor Center, Route 6 and Nauset Road, Eastham. This event was a part of the National Seashore's commemorations surrounding both the 100th anniversary of the sinking of the Titanic (April 14th - 15th), and International Marconi Day (April 15th - 21st). The week-end of January 23rd 2009 was an extraordinary one for both amateur radio and the Binns family. While more than a thousand people either played a part in the special event stations or contacted them, many more people heard interviews on BBC radio or read about the event in newspapers and on the Internet! Then the summer of 2009 was filled with events commemorating the first large scale rescue in open sea coordinated by wireless, including museum exhibits, presentations, and publications.